Remember Billy Chambers? Don’t feel bad if you don’t, no one’s going to revoke your Gladiator status. The name won’t ring a bell, especially if you started watching sometime after season two. He was Scandal’s very first supervillain, back in the days when “Who is the White House mole?” was an overarching mystery complex enough to sustain an entire season of the show. If nothing else proves how far Scandal has come since its debut in 2012, the fact that Olivia Pope is now the double agent should do it. If Scandal still pushed hashtags to goose interest in its season-long arcs, #DamnOlivia wouldn’t be a bad choice right about now. Olivia Pope has officially joined the pantheon of television’s great antiheroes with the revelation in “Vampires and Bloodsuckers” that B613 was behind the death of President Rashad, the former leader of Bashran and Mellie’s United Nations crush. The twist of the knife is the death of Yasmeen, Rashad’s niece, with whom Charlie and Quinn bonded while they tried to protect her from rebel assassins. Every great antihero has a moment when they go from being the character the audience hates to love to the one they love to hate, and for Olivia, that moment was her decision to plant a bomb on President Rashad’s flight. In Olivia’s semi-defense, at least she didn’t authorize the B613 mission to assassinate a foreign leader because she was afraid Mellie’s hormones would lead her astray. She ordered Jake to handle the situation because she doubted Rashad could carry Mellie’s peace accord across the finish line. The decision to detonate the plane is a brutal one, especially when a blameless college student turns up on the manifest. But hard decisions come along with being Command, and Olivia has embraced her new role with unsettling enthusiasm. Unfortunately for Olivia, a rogue military officer tips off Quinn to her involvement in the assassination, and Quinn immediately confronts Olivia with everything she knows. It’s a dumb decision for Quinn to make, considering that if Olivia has broken bad to the point that collateral damage doesn’t disturb her sleep, getting rid of a colleague to cover up the conspiracy wouldn’t be an unreasonable solution. Indeed, when Olivia retreats to her limo after urging Quinn to focus on her imminent wedding to Charlie, she looks extremely worried. Is she afraid she’s about to get caught and brought to justice, or is she grappling with the real possibility that her former protégé has become a loose end? The answer is unclear, and although this season has been in too much of a hurry to put all its moving pieces in place, it’s impressive that the show is now able to sow genuine doubt as to whether Olivia is considering killing Quinn after six episodes. The answer — for now, anyway — is that Olivia doesn’t plan on killing the Artist Formerly Known as Lindsay Dwyer, even though Quinn left an intriguing voice-mail for Curtis Payne. Olivia and Jake are able to determine that Quinn’s failure to show up to her small, casual wedding ceremony doesn’t mean she’s off trying to figure out how to take down Olivia and the new and improved B613. Quinn is actually missing, and probably in danger from forces even more sinister than Black Hat Olivia. But the journey to that revelation is as fun and tense as Scandal has been in ages, and “Bloodsuckers” is the increasingly rare example of how great of a thriller this show can be when it applies itself. Olivia isn’t frequently on defense, but here she’s a cornered animal, panicking as the noose begins to tighten around her neck. The cat-and-mouse game between the teacher and the students is exhilarating. Even more impressive is the way “Bloodsuckers” turns Charlie from an ordinary-looking monster into a heartbroken underdog. When he realizes Quinn really won’t be showing up for their wedding, he’s furious, and demands that the gang tear down the impromptu chapel they’ve built in QPA. 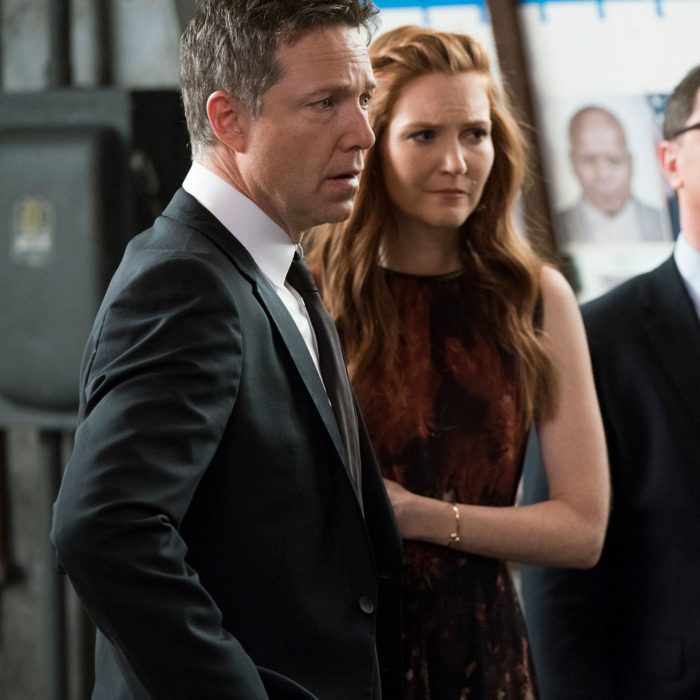 Charlie hasn’t gotten many tender moments on this show, and actor George Newbern nails his first opportunity to show the softer side of a torturer for hire. If only Charlie’s moment hadn’t grown out of the least effective story line of the episode. By way of sheer, cruel fate, the whistle-blower that tipped Quinn off just so happened to previously work for Fenton Glackland, who becomes a smelly red herring in the search for Quinn. Charlie hears the name and immediately goes off the deep end, kidnapping Glackland and torturing him for information he doesn’t have. The Glackland connection felt like one twist too many, and a transparent effort to rope Cyrus into a plot that didn’t otherwise involve him. But it’s tough to quibble with an episode as brisk and bold as “Bloodsuckers,” one that suggests that after years of going out of its way to maintain its status quo, Scandal might finally be a show in which no character is safe.